Hi there, everyone! 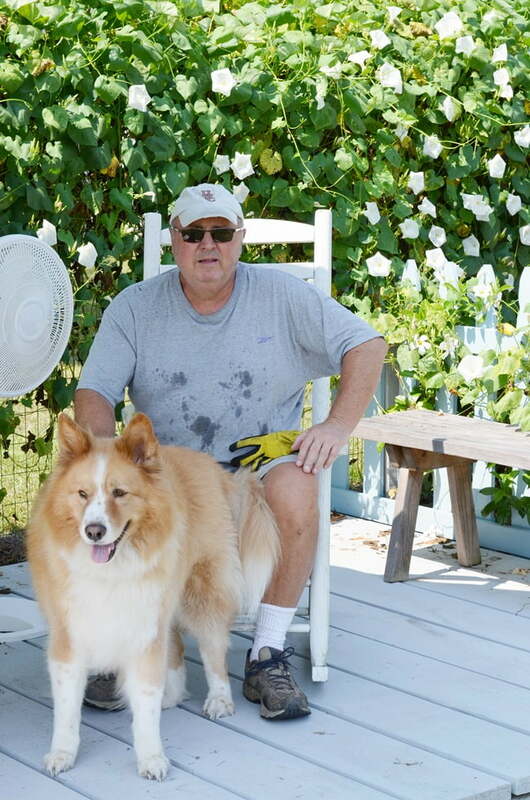 I hope you had an enjoyable Labor Day weekend. 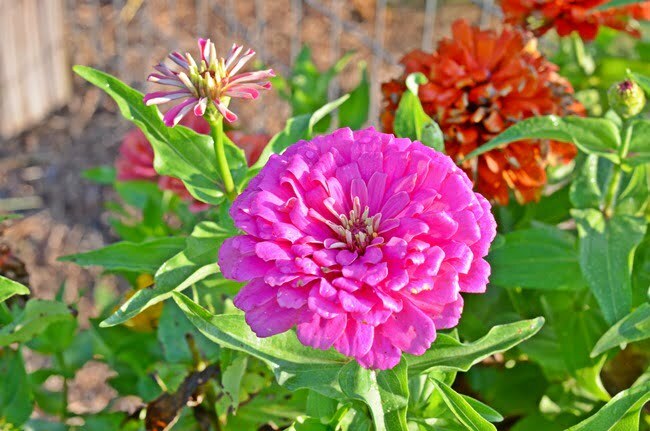 Before summer yields to fall, I thought I’d show you some zinnias and other flowers that are growing in our garden. Early this spring, we spruced up our painted plastic pots that we’ve used for several years now. Last year, they held our pepper plants, but this year I decided to plant zinnias in them. And they have made me smile every time I enter the garden. 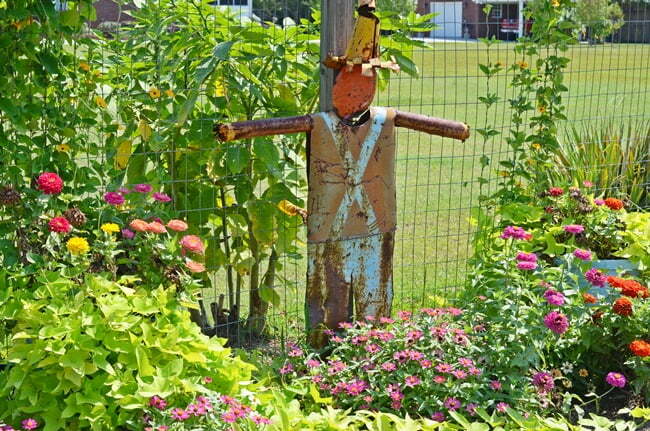 Some of them were planted in the ground in the bed where Rusty, the scarecrow stands. Most of those are the kind that grow into a small mound while the ones planted in the pots are taller. In the two pots in the bed, I transplanted 2 starts of black-eyed-Susan vine that came up in another part of the garden. 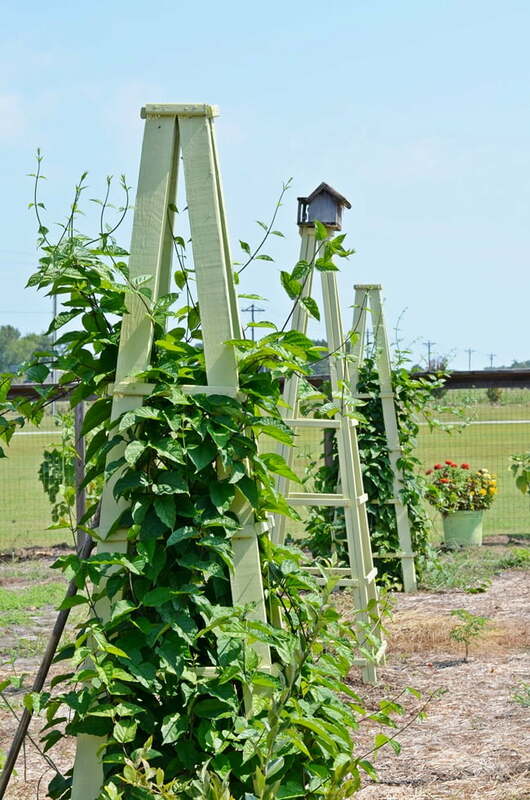 I just love how they’ve climbed the fence behind the pots. 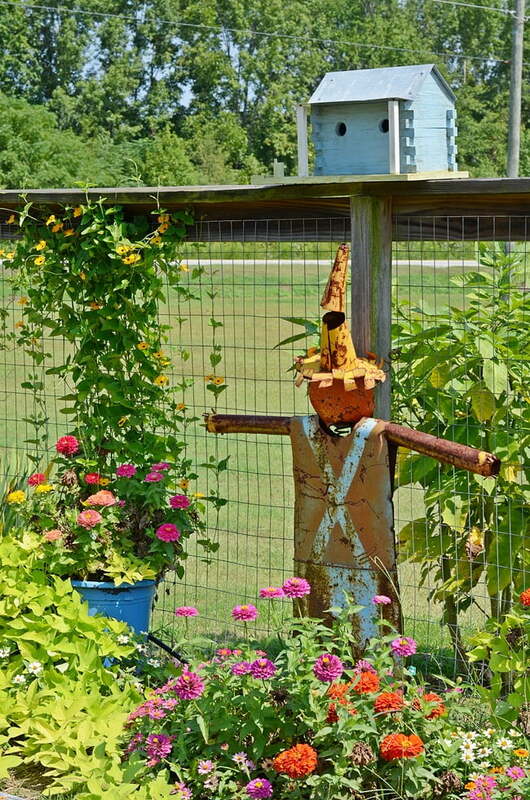 In this photo, it looks like Rusty is guarding the zinnias, don’t you think? They are such happy flowers. Well, at least they make me happy! And the pollinators love them, as well. 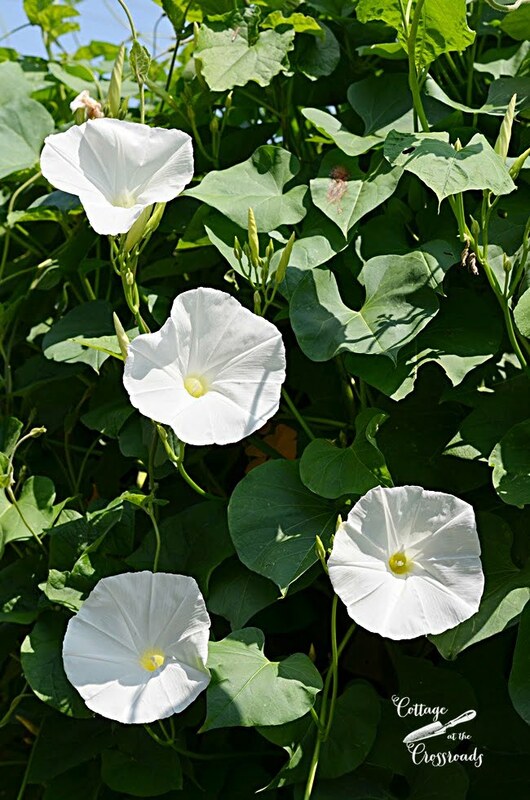 Which is, of course, one of the reasons why we purposefully include flowers in our vegetable garden. So every few days this summer, I found myself cutting a fresh supply of them to sit on the window sills in our kitchen. 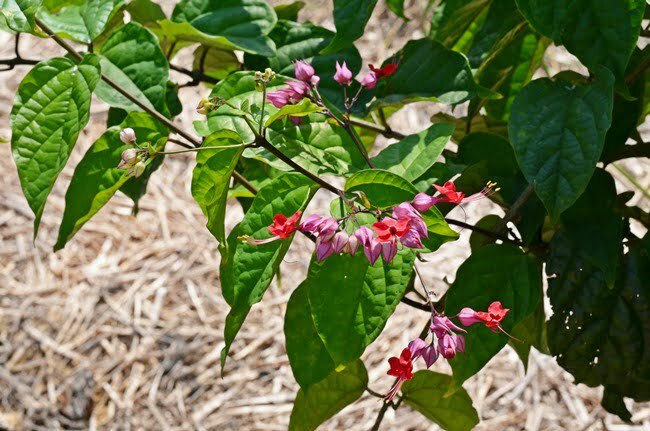 The vine produces pretty red and purple flowers from time to time. On the other side of the garden in the new flower bed that we created where the compost bin was originally located. 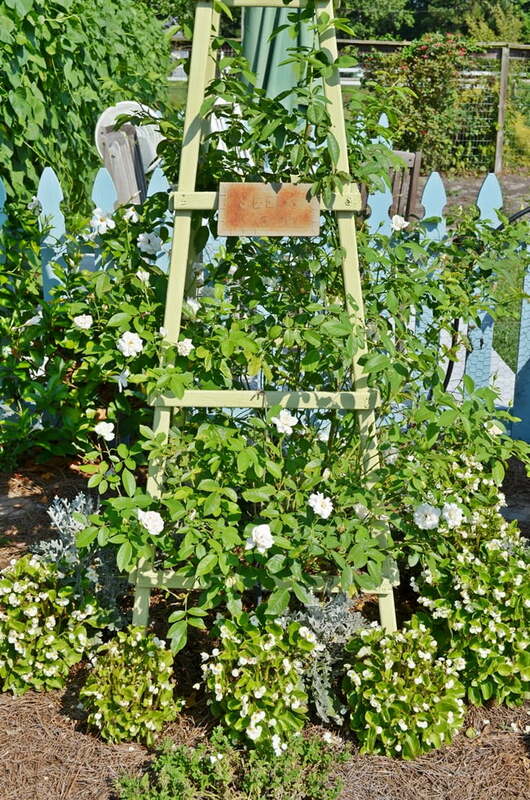 The white climbing rose has grown tremendously over the summer and has given me lots of blooms. You can see how it has flourished since we planted it by looking back at the post: Changes in the Garden. 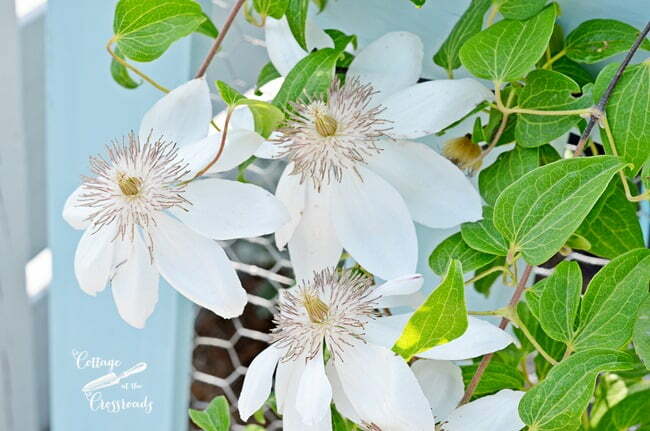 The new white Henryi clematis vines that we planted this year have done well, too. They have bloomed all summer long. 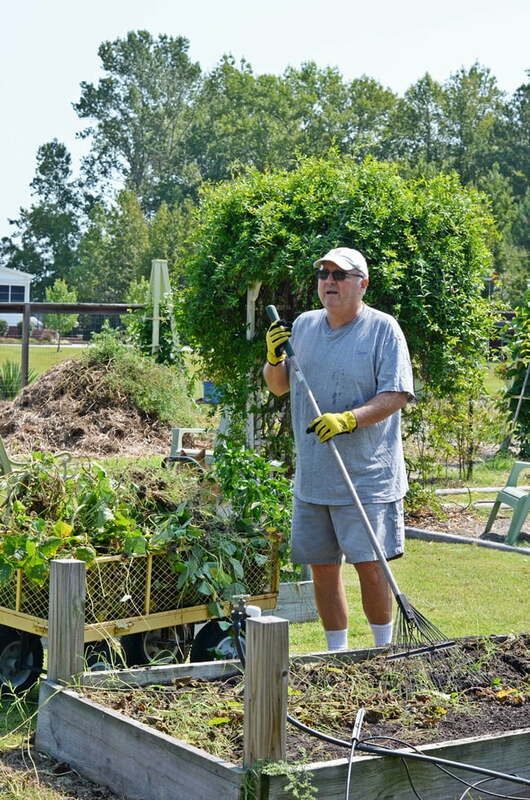 For the past several weeks, Leo has been preparing the garden for fall planting. This is the area where many of the tomatoes were planted during the summer. 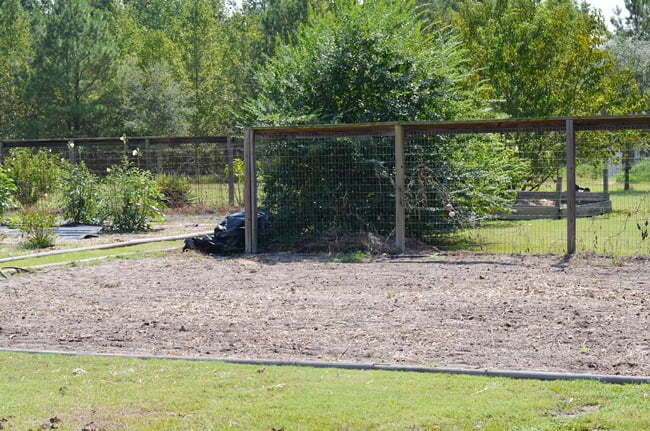 In the hot August heat, Leo pulled up the tomato cages and the plants, removed the landscaping fabric and irrigation lines, and then fertilized this area. 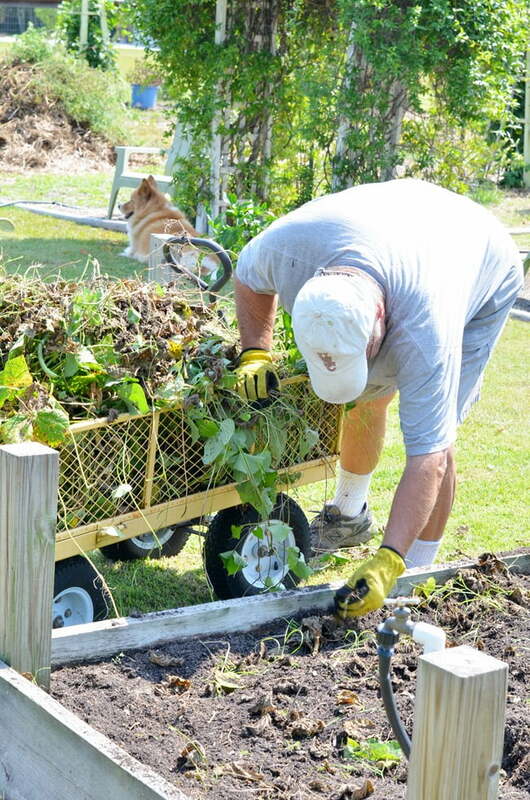 Here he is cleaning out a raised bed. Sometimes gardening is not enjoyable. On days like that, you’ve got to keep the big picture in mind. 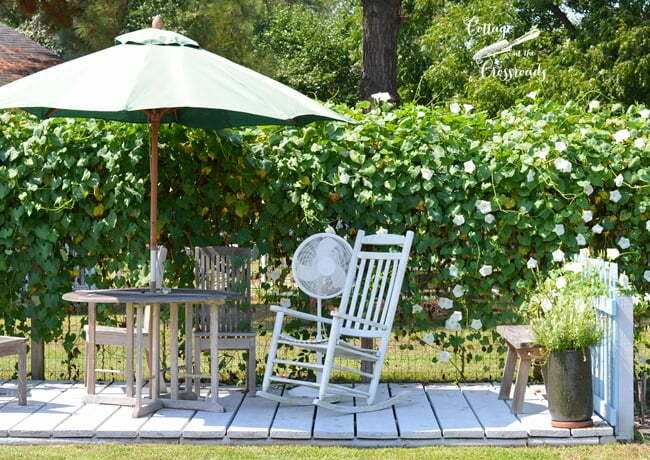 Luckily, we have our freestanding deck in the garden where we can get a little relief from the heat. And do you see what’s covering the fence behind it? 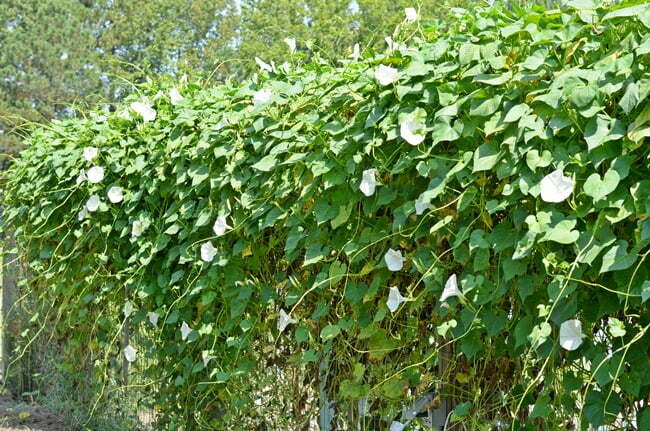 Those are white morning glories that I planted from seed after we built the deck in the spring. I thought they’d never start blooming, but they finally did in late July. I think they are just beautiful, and I love the contrast between the white flowers and the green leaves. They definitely created the “wall of white flowers” that I was envisioning when I planted the seeds. When Leo and Lucy need a break, it provides a pretty spot. Today we labored in the garden and planted 48 broccoli plants and 48 collard plants and ran the drip lines to them. Planting cool season plants is how we start fall around here at the Crossroads. « Belgard BBQ Kit Giveaway! Just now catching up on posts I have missed this last month or two. Everything looks great and looks so satisfying! Lucy is so precious. She makes my heart melt. Blessings! Such a pretty post! Love your zinnias in the painted pots! You 2 got it going on!! Zinnias are my absolute favorites! I just wonder how you keep them from getting mildew? 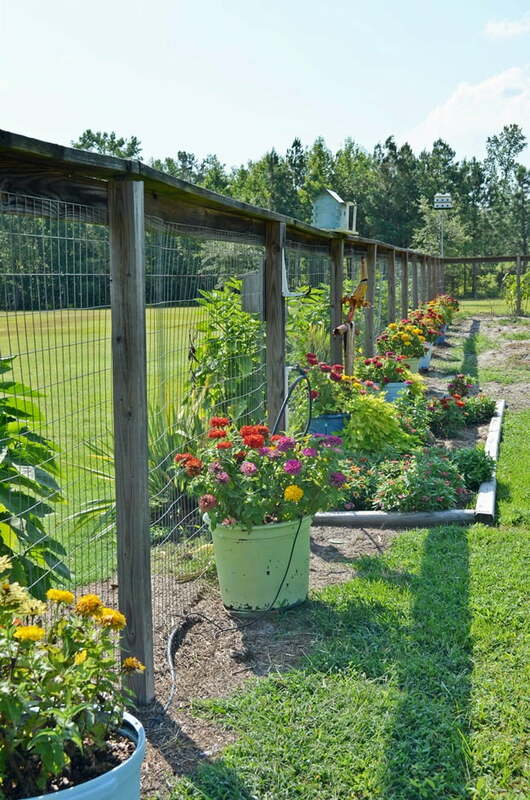 Angie, we ran drip lines to the pots this year and I think that prevented any mildew. 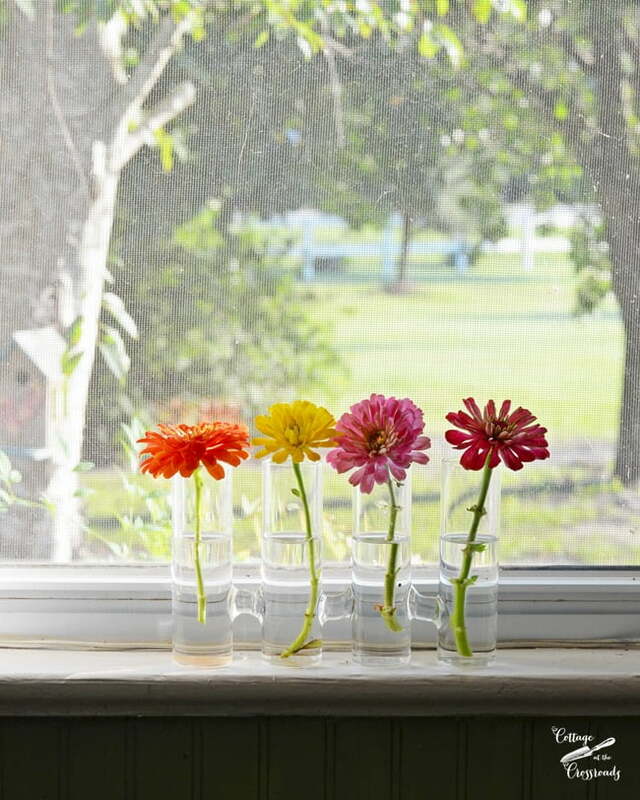 In other years, if we were watering from above, the zinnias would eventually develop mildew. Plus, we had very little rain this summer, too! Love your pictures! We’re the Zinnias plants or seeds? Cathy, I got a late start planting my pots. A local greenhouse was selling their flats of zinnias half price in May so I started with transplants. Most years, though, I plant seeds. Those fall veggies should be ready about the time you guys move in! Jane and Leo, I love your gardens, very colorful . You are quite a team and your projects always are a delight. I love reading and seeing your posts. Thank heavens that we both enjoy gardening, Lynn! 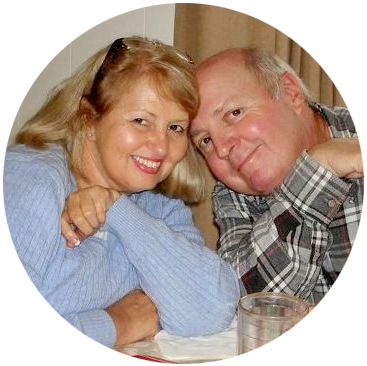 Two people can accomplish so much more than one! We do enjoy sitting out in the garden watching things grow, Donnamae! Everything is beautiful Jane and Leo, you two sure can make a garden look fantastic. Awww, Dawn! Thanks for the compliment! I would plant many more flowers, if I could! Peggy, we feel very fortunate to have the space and good health to have such a garden! 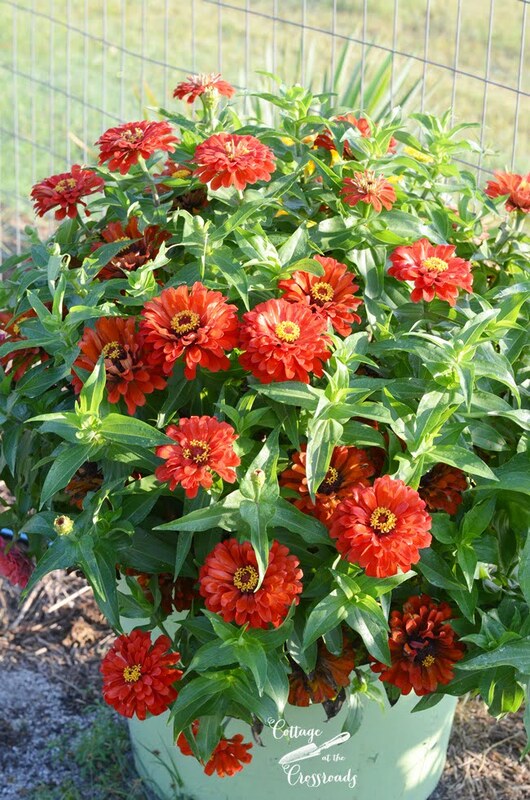 Love Zinnias….one of my favorites. 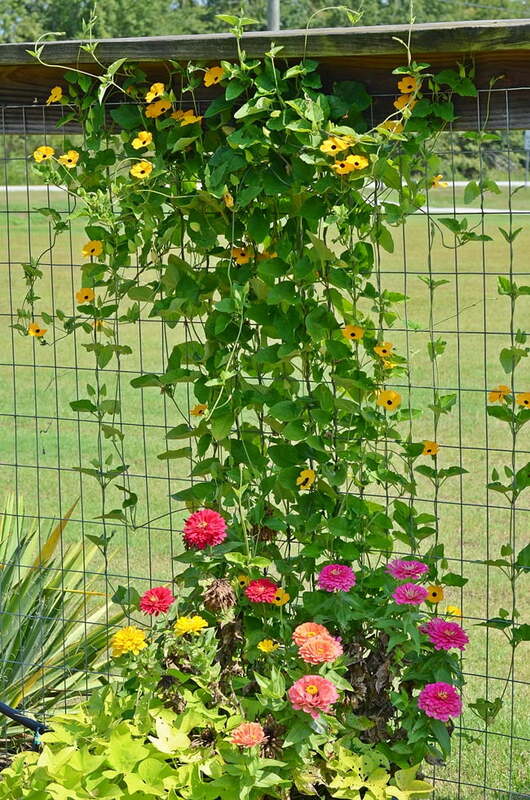 I bought a black-eye Susan vine at our local nursery this year and planted it on a trellis by a bird feeder behind a couple of lantana. It has gone crazy and it is beautiful!! Love your pics!!! Robyn, that sounds really pretty! The black-eyed Susan vine will reseed itself and you can look forward to having them again next year! Jane the garden is as beautiful as ever. I just found the black eyed susan vine this year. Have it growing up our bird feeder posts. Do you think it is too late to put out broccoli in Kentucky (zone 6) ? Have a great week. We are getting fall weather next week, thought that would be a good time to pull beans and plane the kale and broccoli. Have a great week. Tonia, I would think that it would be a little late for you to plant broccoli. We have found that it will tolerate a light frost it will be fine but if you have a hard freeze that the broccoli will get mushy. I’m not sure about kale, though. You may be still be able to plant it. Thank you so much for sharing all those pics! I love zinnias but will sometimes get a whitish moldy look on them. Any ideas? Lisa, I think that if you water from above, that the zinnias will develop the mildew. This year we ran drip lines to the pots so that they got water at the roots, and that worked very well for us this year. 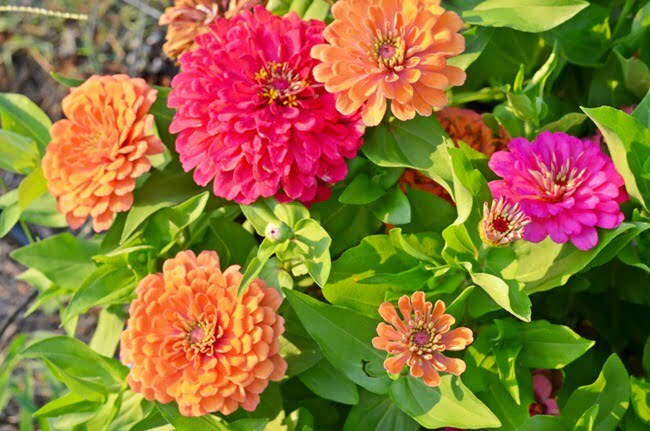 I definitely agree: zinnias are happy flowers! They are one of my all time favorites. My garden center told me, on Saturday, that they are getting in the first load of snapdragons any day now….they, too, are some of my favorites!!!! I am actually sorry to see summer end: I know. many people feel just the opposite…but oh how I love it! Libby, I love snapdragons, too, especially the really tall ones called rockets! My garden is approximately the size of the one where Leo is standing with a rake. I have only had is for two seasons. I wanted to make it bigger this year but never got to it. I don’t know how you two can do all you do. My yard is quite shady so I am limited but I can barely handle this one and got very little from it this year. My cauliflower died and out of all my pepper plants I got one pepper. I did get tomatoes which made me very happy! So glad you got some tomatoes from your garden, Patty! We only plant cauliflower in the fall because it loves cool weather. Our springs are very short and it heats up so quickly that the cauliflower doesn’t do well for us then. 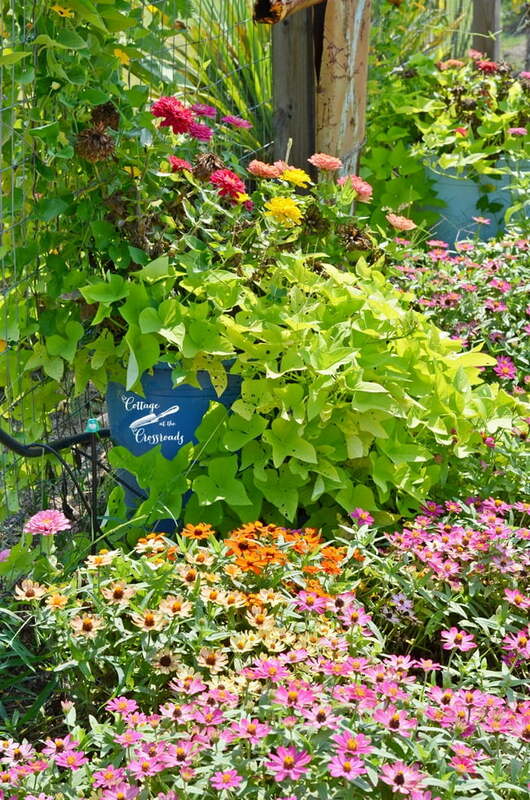 I am always so inspired by your garden photos!!! I am sure it is hard work, but oh the rewards too. 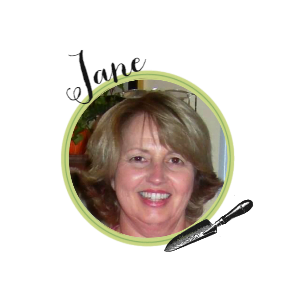 I have retired from teaching and my hubby still has a few more to go as a high school principal. We are on the search for a piece of property to have one day down the road. We love the water as we live on a bayou, but there is just a bit of country in both of us! Good luck in your search for some rural property, Sandy! I love your beautiful garden! So pretty!